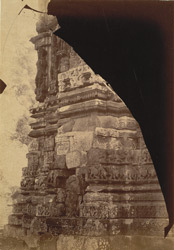 Photograph of the sculptured facade of the great temple at Janjgir, taken by Joseph David Beglar in 1873-74. J.D. Beglar described this temple in his 'Report of a tour in Bundelkhand and Malwa, 1871-72; and in the Central Provinces, 1873-74' (A.S.I. vol. VII, Calcutta, 1878), pp. 204-211, "The great unfinished temple stands on a large oblong terrace; the external walls of the terrace, up to the point where the sloping backs of the seat should be, appear to have been completed...The temple consists of a cell only; it is profusely sculptured outside with statues as at Khajuraha, but without any obscenity; the tower is only half, or rather less than half, finished, and is also profusely sculptured right up to the top as far as finished."